Do you have just started a WordPress site and don’t know what to do next? Then here is a Complete WordPress Course for Beginners in PDF format. After reading this course completely you will be an advance blogger. Because this course contains all knowledge from choosing domain name and installing WordPress to doing SEO and promoting posts/products. Why to Read this eBook? Description : This is a complete WordPress course for beginners including all the topics for beginners to be cleared. For complete understanding Tris have added pictures and screenshots in this book. 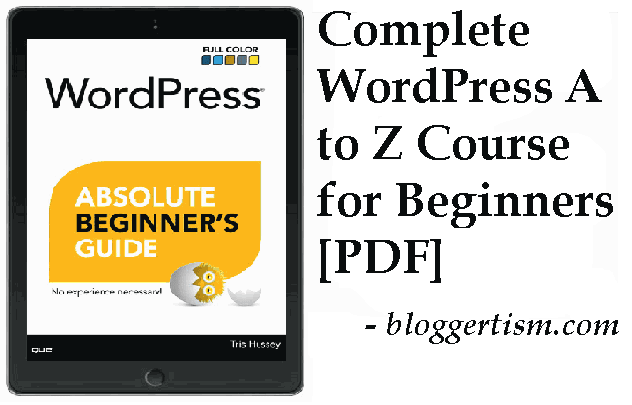 It is really a WordPress absolute beginners guide. Also I want to tell you that each topic contains many sub-topics for complete understanding. This is my personally recommended eBook for WordPress courses. Nice article, This post is really good as Complete WordPress Course for Beginners. Beginners need to learn all about basic & important WordPress factors so this PDF file is perfect for Beginners.